WEST DES MOINES, Iowa — Jeremy Gosch, executive vice president of strategy and chief merchandising officer at Hy-Vee, has been at the center of three major initiatives that the company has introduced over the past year to ensure that the retailer remains relevant in the lives of its customers. Hy-Vee’s rollout of an apparel line, online shopping site and new in-store restaurants demonstrates its eagerness to recognize and quickly adapt to changing lifestyles of consumers. The company’s most recent launch involves a partnership with F&F, a British-inspired international fashion label that offers men’s, women’s and children’s clothing, shoes and accessories. F&F, owned by grocery and general merchandise retailer Tesco, is riding the fast-fashion trend popularized by such retailers as H&M and Forever 21, which have taught consumers to buy now or miss out, a lesson that helps cap margin-thinning markdowns. Gosch was promoted to his current position in August. Since joining Hy-Vee 21 years ago, he has served in a number of store-level positions, including second assistant manager, manager of general merchandise and manager of perishables. He was promoted to store director in 2000. 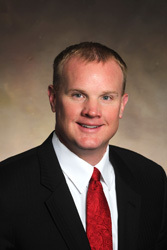 In 2012, Gosch was promoted to assistant vice president of operations for Hy-Vee’s northeast district. In 2014, he was promoted to vice president of general merchandise and health and beauty care. The next year, he became senior vice president of merchandising. Chief merchandising officer was added to his title in early 2016. In recognition of his leadership abilities, the editors of MMR are honoring Gosch as one of Seven Executives Who Made a Difference in 2016. In his leadership role, Gosch also has overseen the launch of Hy-Vee’s Aisles Online e-commerce service, which was introduced to more than 240 stores in eight states following a successful pilot of the program. Through the service, customers can order and pay for their groceries online and either pick them up at a store or have them delivered to their home. Hy-Vee is planning to open its first online order fulfillment center in Urbandale, Iowa, near Des Moines, later this year, in a refurbished building that will also house Hy-Vee’s employee training facility. As online shopping grows and stores take on more orders, there have been more employees going through the stores to fulfill orders. The new fulfillment center should relieve much of that traffic, Gosch says. Online shoppers can use their hy-vee.com account to select their preferred store before shopping that store’s inventory. Customers can also create shopping lists and mark products as their favorites. When customers link their account to their Hy-Vee Fuel Saver + Perks card, their most recently purchased items will automatically be listed first, creating a seamless shopping experience. Once customers place an order, an Aisles Online personal shopper hand-selects the products. The groceries are kept in climate-controlled totes until they are unloaded into the customer’s vehicle or delivered to the customer’s home. Store pickup and home delivery are both free for orders of $100 or more. For orders under $100, shoppers pay $2.95 for pickup and $4.95 for delivery. Gosch says he’s also pleased with the increase in the number of Hy-Vee Market Grille restaurants, an extension of the culinary plank of the company’s strategic platform. “It’s a slightly different business for us, but statistics show that more people are eating out these days, so it’s on trend with what people are doing,” he says. The first Hy-Vee full-service Market Grille restaurant opened several years in Urbandale. The restaurants include wait staff, a bar and an extensive menu featuring such fare as top sirloin, grilled salmon, burgers, sandwiches, salads, flatbread pizzas, appetizers and desserts. The restaurants are adjacent to Hy-Vee grocery stores, with separate entrances but also connected to the stores via a common door. “They get people into our stores in the evenings,” says Gosch, who notes that those who come solely for the dining experience are associating Hy-Vee with fine food. “The plan is for all of our stores to have a Hy-Vee Market Grille by the end of 2018,” Gosch says. The company’s smaller stores won’t get a full-service restaurant but will offer diners a chance to order freshly prepared food to eat on site or take out. In addition to restaurants, Hy-Vee is expanding its culinary expertise by adding several new food options in its stores, including Sweet Shoppes; juice and smoothie islands; made-to-order burritos, tacos and rice bowls; and new hibachi-style grills that allow chefs to prepare customized dishes for customers and their families.